This blog is where I can pour out my heart with my longing for God. The Old Paths: Is Your Heat Running? Sometimes you feel as lonely as a salmon in Belews Lake. You think you’re the only one who feels the way you do. You wonder if perhaps you are an oddball—a square peg trying to fit into a round-holed world. Then something happens to prove you are not alone. Yes, you may be in the minority, but rejoice—there are others like you! For example, I once thought I must be really weird to always reach past the first few slices of bread in the bag to get some middle pieces for my sandwich. When I confessed my idiosyncrasy on Facebook, numbers of folks chimed in excitedly that they did the same thing and had thought they were the only ones. I imagine that some of you are nodding right now or grinning as you think, “So it’s not just me!” No, I found out from Facebook comments that we are part of a large company. Before long, a friend agreed, “We are covered to our eyeballs but no heat till November.” My cousin’s wife said she was determined not to turn on her heat just yet. A friend much farther north commented that she picks a specific time to turn on her heat and tries to stick to it. It might mean wearing socks to bed or throwing on another blanket, but doggone it, we’re going to hold out! Three different friends told me it was “the principle of the thing,” leaving me to ponder just what the principle is. I have some ideas. Bear with me as I psychoanalyze you heat-postponers. For some of us, like Angela, it’s a matter of conserving fossil fuels—a worthy principle indeed. If we all held out a little longer turning on the heat (or AC in the spring), we would save huge amounts of the fossil fuels we don’t want to use up. Another principle also involves conservation—of our money! Don’t you love the lower power bills that come in spring and fall? There were times in my past that money was so tight it might mean buying fewer groceries if we ran the heat any more than was absolutely necessary. Even now with better financial conditions, my decision to once more be a stay-at-home mom means we must be very thrifty. My daddy clings to yet another principle—that it’s a matter of building toughness of character. This is the man who would, in fun, make me bear him tickling my foot when I was a kid—telling me to set my mind that I could take it, that it would make me tough. It worked, and I’m grateful. Try tickling my foot; I won’t budge. You say, “How silly.” No, not really. Such principles in seemingly “silly” things carry over into more important things. That “I can take it” stamina that Daddy helped build into my character propelled me through the births of my last three children with no medicine at all—a healthier situation for all involved. It has helped me be able to go for 18 years (this coming December) without taking a pain reliever—yes, not even one Tylenol or Advil. This has to be good for my liver and overall health. America has become such a nation of convenience that we self-medicate at the merest hint of pain. Daddy preaches that we have become a country of spoiled people who “can’t take it anymore.” He tells me how people on the old paths used to function just fine without AC. Now we virtually melt without it. It’s a matter of how we condition ourselves. I believe there is another principle at work here—the need to prove our toughness, not to be bested by the elements. This rationale is similar to my daddy’s principle of building character but is perhaps rooted more in pride. Yes, it was possibly my stubborn pride which made me suffer in a house where the thermostat has registered as low as 54 degrees several mornings recently. Whatever the reason, many of us in Stokes County have been uncomfortable here in mid-October as autumn hit us with the first cold temperatures of the season. And although warmer weather may resurface, don’t be fooled into thinking it will last. Either bring out the flannel sheets, fuzzy socks and fleece hoodies and grit your teeth a little longer or turn that heat on! It’s a long time ‘til spring. . . Recently I read a quote by the actor Morgan Freeman that made me stop and think. He stated: “I don’t want a Black History Month. Black history is American history.” In theory, I agree with his statement. In reality, I do not. In an ideal world, there would be no Black History Month. I, like Freeman, aspire to that type of world. However, we live in an imperfect world which makes Black History Month necessary if we are to learn of the historical accomplishments of a prominent minority in this country. A world free from prejudice and racism? THAT’S where I want to live. Unfortunately, that address is still unknown. And thus, we must have a Black History Month. What a great time this is to remind ourselves that American history isn’t just one hue. How wonderful it is to learn of great accomplishments by men and women of color—deeds and names that often are not in the textbooks. Black History Month has helped me to decorate my Wall of Heroes in multi-colors. And sometimes those heroes are right here in our own backyard. George Washington Carver—love him. Dr. Martin Luther King Jr.—wow. Harriet Tubman—crazy about her. John L. Hairston—heart him. Rev. Greg Hairston—I tip my hat. Oh. What? You don’t remember reading about the last two in your History 101 class? Well, that’s probably because they are homegrown heroes for us here in Walnut Cove, NC. They are featured in a book that gained national acclaim, The Hairstons, by Henry Wiencek, who, by the way, came from Boston to do a program at the Walnut Cove Colored School back on Sunday, March 13, 2011. If you haven’t read this book, I highly recommend it. It examines the lineage of the Hairstons—now a huge clan all across the U.S. whose point of origin as a dynastic family is Stokes County, NC. The story is spellbinding; the book, well-written; and the information, priceless. Wiencek has no ties to the story—he is not black and he is not from the South. He just found the story a riveting one that needed telling. If you don’t have time to read the entire book, I suggest reading at least Chapter 13—”The Liberation of Walnut Cove.” I have lived in and around Walnut Cove all of my life but was stunned that I had no knowledge of what happened in 1968, per Wiencek’s account. Did you know there was a protest march in Walnut Cove in the midst of the ’60’s desegregation troubles? Did you realize there was a scaled-down version of a sit-in (stand-in) at Vernon’s Grill (now The Milk Bar) on Main Street, Walnut Cove? Before MLK Day 2011, I began reading Chapter 13 aloud to my children because I felt they needed to know what struggles were faced right here in their hometown. I had planned to read only a small segment of it, but they were so engrossed that they begged me to read the entire chapter. I gladly obliged. When reluctant Stokes County was ordered to hop onto the forward train of desegregation, the decision was made to close the all-black London High School. The black community rose up to protest, turning out en masse at a public meeting with the school board. There their beloved and longtime London High principal, John L. Hairston, delivered a stirring speech. He urged the school board not to close the school but to integrate it. His impassioned pleas, quite out of character for this soft-spoken man, seemed to have fallen on deaf ears. Rather than concede defeat, the student council of London High chose to protest the decision. Greg Hairston, a senior at the school, and other student government leaders such as John L.’s daughter Mona, led a march down Main Street, Walnut Cove, amidst heckling and jeers from white bystanders. As the group approached Vernon’s Grill, student leader Vincent Withers declared that he was thirsty and was going into the still-segregated restaurant to get a soda. Despite efforts to stop him, Withers entered after local deputies informed the owner that there was nothing legally they could do to prevent a black man from entering the front of the establishment rather than going to the back door per longstanding tradition. Withers entered, ordered and drank a soda before quietly exiting. Walnut Cove changed forever that day. Although segregation had been illegal since 1964, the movie theater, laundromat and town restaurant had never been integrated. But after that warm March day in 1968, desegregation slowly became the mode in the Cove. Soon, blacks didn’t have to sit in the balcony to watch movies anymore, and they could wash clothes at the laundromat. I am privileged to have known two of these modern-day heroes. John L. Hairston, now deceased, was my principal for three years at London and visited my home a few times when my mother, a reading teacher at the school, had the faculty over for get-togethers. He and his precious wife, Ruth (my fifth-grade teacher), also stopped by with a gift when my baby brother was born. He was a man of such class and character that I get misty-eyed thinking of him. I can see his gentle eyes now and hear his kind, well-modulated voice. Greg Hairston is now the pastor of Rising Star Baptist Church in the London community of Walnut Cove. I have been privileged to be in prayer meetings and church services with him. I never fail to be moved each year when I see him walk yet again down Main Street, Walnut Cove, during the MLK March. These are those who may never be written up in a history text for school children, but they have a place on the unwritten honor roll of black heroes. There are others who won’t even get a mention in a book like Wiencek’s—the Frank Daltons who coached integrated baseball teams when that wasn’t the popular way in Walnut Cove, the Malcolm Dixons who ran basketball camps to offer local children of all races opportunities to be active in worthwhile activities and escape the vicious cycle of drug abuse and poverty in this area, the David Hairstons who work tirelessly to make sure predominantly black communities are included in Walnut Cove and that the children have playgrounds and resources. Although it is obvious from my columns that I am a Christian, I try to stay away from too much discussion of religion in my writings for secular publications. I was advised to do so years ago when I was editor of The Stokes News, and I obeyed…..with only the occasional mention of “the Good Book” or “the Man upstairs” (couched in those generic terms to spare me any scolding from the higher-ups). I typically write about family, our Southern dialects, county events, nature. Yes, I noticed that even big-city secular newspapers often have a regular religious columnist or a “Religion” section. The Washington Post even has a religion reporter. Nonetheless, I kept on writing columns that would not rankle the likes of my former publishers at Heartland Publications, being the good little girl that I am. Recently, there was something in the realm of religion going on across this country that is most definitely newsworthy. In fact, it is so newsworthy that secular newspapers were picking up the scoop. For instance, I read an account of these events in The Logan Banner, a newspaper owned by the same company that owns The Stokes News. The event? Revival breaking out amongst youth in WV and KY schools. No, I’m not getting this confused with the movies “Woodlawn” and “Facing the Giants.” This isn’t a movie I’m talking about; it’s real life. Teenagers were preaching in the halls of their high schools. Kids were repenting in the school gym during lunch period. Youth were congregating on football fields at night to pray. Although I’m sure this youth revival was actually birthed through prayer long before the initial sparks flashed, one of the first catalysts for this fiery outbreak was a young man named Skyler Miller, a two-time leukemia survivor who decided to preach in the halls of West Virginia’s Logan High School on March 24, 2016. Rather than mocking him, students began to sit down in the hall to listen to Miller. By the next day, Good Friday, he was preaching in the school gym on his lunch break. Less than a month later, just a bit south at Mingo Central High School, the school’s prayer club announced that a revival service would be held in the school auditorium. By the next day, word got around that the auditorium would not hold the expected crowd, so the event was moved to the school’s football field. It’s a really good thing they moved it because the Williamson Daily News reported that nearly 3,000 people showed up. (And folks, this is in a town as small as my hometown of Walnut Cove—population 1,400!) Pictures from the event went viral on the Internet—teenagers with their hands raised, tears pouring, on their knees, being baptized in an inflatable swimming pool in the end zone. I saw pictures of weeping, praying students at several schools in the WV/KY border regions—not just high schools, but also elementary and middle schools. It was indeed reminiscent of the scene in the 2006 movie “Facing the Giants” where students are in prayer huddles on the football field, as well as the scene in the recent Sean Astin movie “Woodlawn” where students are praying in the school gym. The latter is, in fact, based on the true story of the revival that swept through Woodlawn High School in Birmingham, AL, in the mid-1970’s. Why am I so interested in this revival phenomenon? Because in 1996, I dreamed of a great revival in the area of Southeastern Middle School in Walnut Cove, NC. It was the first of many dreams of a revival starting in Walnut Cove, a town I hated at the time. I was taken by surprise by these dreams and fought for a while against what I knew to be true—that I would not be able to escape my hometown and needed to stay in order to pray for the coming revival. In October 2000, I attended a Christian youth conference in Charlotte, NC. I had been studying the great 1906 Azusa Street Revival in Los Angeles and was desperate to find a rare old book by Frank Bartleman, an eyewitness of that revival. Suddenly, I was approached by an older lady whom I did not know. She handed me that very book and said, “I got this for myself, but God told me to give it to you. You’re going to need it.” Talk about astounded! I never saw that lady again. Fast forward through 14 years of praying, hungering, thirsting for this revival in the town that I no longer detested but had fallen head over heels in love with. We arrive at late 2014 with me at a prayer meeting at the church I pastor, The Well. Enter another woman unknown to me. Since she came with a visiting friend from a church in Clemmons, NC, I assumed she was trustworthy. After a time of prayer, I suddenly felt from God to go to this mystery lady and ask her to pray over me about Walnut Cove. I hesitated but finally yielded. Imagine my shock when she told me she had been waiting for me to come to her, and then laid her hands on my head and began to speak of Azusa Street and a revival coming to Walnut Cove. She spoke of things she could not have known in the natural. I had known that, to a degree, ever since that incredible Charlotte youth conference in 2000. This is why I organize annual youth rallies in Walnut Cove at Lions Park or in London Elementary School Gym. This is why I host youth Bible schools all summer long…..because I believe what swept through these small coal-mining towns of West Virginia and Kentucky is going to sweep through Walnut Cove as well. Our youth are hungry for something more than traditional religion. They want a current move of God. They’ve searched long enough in drugs, alcohol, promiscuity. They want something real and lasting. Yes, I’ll go back to writing about springtime and children and the old paths. But I just figured that if the Washington Post, The Logan Banner, the Williamson Daily News and others can touch on religion occasionally, so can I.
I’m catching my breath after a whirlwind weekend. Besides the typical weekend routine of church activities and ball practices for multiple kids, my sister, brother and I threw a 50th anniversary party for my parents. It was worth every ounce of energy expended. A golden anniversary is a once-in-a-lifetime event. It should be celebrated and remembered. Fewer and fewer couples make it to that milestone in this day and age, and thus I spent much of the weekend pondering what makes a happy marriage. I’m not talking about what makes a marriage last, because I’ve seen some miserable marriages that lasted several decades. I’m talking about what makes a marriage happy. On Friday, I went to Ingles grocery store to buy the cake for my parents’ surprise party. I was rushing to get into line at my niece’s register, but an elderly couple made it there just before I did. Although I was in a supreme hurry, it turned out to be a blessing that I was behind this charming couple. I heard the lady comment that she and her husband would celebrate 68 years of marriage this year. I stared unabashedly at her. “Did you say 68 years?” I interrupted in my never-met-a-stranger way. She smiled a dimpled smile and said yes. I told her she didn’t look nearly old enough to have been married that long. She proudly told me, “I’ll be 87 my birthday.” My eyes bugged out as I told her truthfully that she looked about 15 years younger than that. Then came an even bigger shocker. She told me they only dated for two weeks before getting married. Don’t we tell our children they better get to know someone well before they make that vow? Don’t we teach them that marriage is a decision that must be well-thought out? How can you think out such a thing in two weeks? This sparkling-eyed lady became even more animated as she told how she had met “Mr. Right.” She said that as soon as he walked into her office all those years ago, she thought he was the best-looking thing she had ever seen. They fell for each other on the spot, dated two weeks, tied the knot and aren’t far from 70 years together. “When you see a good thing, you better grab it while you can,” she grinned like a mischievous little girl. Meanwhile, her tall husband, who also looked much younger than his years, stood to the side smiling tolerantly yet affectionately. He teased her a little, and you could tell those love fires were still burning. Here is a marriage, like that of my parents, which has survived an amazing number of years, not with the bitter silence and withdrawn emotional state of many marriages, but with laughter and love. Too many times I’ve heard older couples say they don’t see a need for a 50th anniversary party because there’s nothing to celebrate. That pretty much tells you the sad state of their marriage. Obviously, the secret to a happy marriage is not necessarily a long courtship with well-thought out plans. I’ve heard that children whose parents have a happy marriage have a better chance of having the same thing. Statistics in the last decade have not proven this to be true. My brother and I were both the product of a happy home but ended up divorced. I take my share of the blame for the breakup of my marriage and will grieve over it, to a degree, for the rest of my life. On the other hand, my good friend up in Sandy Ridge came from a broken home yet has been married happily for 30 years; so has his sister. Kurt Warner, who was one of my favorite pro football players, tells of growing up in a broken home with many trials and tribulations, yet his own marriage has endured happily for many years—a real testimony for a professional athlete. I knew a couple in Mt. Airy who were blissfully married for well over 50 years when the husband died. The wife, usually a stoic woman, fell apart, wondering aloud how she was going to live without him because they had been so close. Yet two of their three children ended up divorced. This proves yet again that growing up with happily-married parents does not ensure marital bliss for someone, and vice-versa. Although the precious lady I met in Ingles talked about her husband’s stunning good looks 68 years ago on the old paths, we all know that physical appearance fades. The most stunning woman will eventually wrinkle and go gray. Even Botox and Miss Clairol can’t completely fix the ravages of old age. The hottest man around will see his looks decline as his hair thins or falls out and his love handles develop love handles. So physical appearance obviously isn’t the secret to a happy marriage. Of course I believe a reliance on the Lord is a key, but I’ve seen many a Christian stick it out “for the sake of the children” while being absolutely miserable for the long haul. Some of you are thinking, “People just need to be committed and keep their word!” I agree, but remember—the subject of this column is not what makes a marriage last, although I believe that is supremely important. It’s what makes a marriage happy. Laughter surely plays a key. My daddy was telling us at Sunday dinner about the April Fool’s joke he played on my mama this year. He said he was cracking up the whole time she was falling for it, and she said that when he reminded her what day it was, they both just fell apart laughing. A couple who can laugh together like that after half a century has found a secret. I’m convinced that finding someone you laugh often with is a treasure. Kindness, thoughtfulness, forgiveness, loyalty, humility—all of these are keys to a happy marriage. I’m obviously no expert, but I want to be. No one wants a failed marriage. To that adorable couple whose names I don’t even know, to my parents and all others who are making marriage work well—I tip my hat to you. Keep laughing and keep loving…..forever and ever…..Amen. The Old Paths: It’s Snowing in Pinnacle! It’s snowing in Pinnacle. Those were magic words when I attended South Stokes High School. Even now I get a childlike, anticipatory feeling when I think about that phrase. Funny how some things become so etched in your psyche that years later they can still unconsciously elicit a certain response from you—like passing through the Mall and smelling a particular cologne which makes you suddenly remember your 11th grade summer romance and the boy who wore that scent. Or hearing a certain song on the radio that transports you back to junior high days when that song was in vogue. “It’s snowing in Pinnacle” does that to me—brings back a feeling of being at South Stokes High School, laboring through the post-holiday January doldrums, seeing the school year stretch endlessly on with no break in sight—Easter vacation merely a dim mirage on the monotonous horizon. Pretty soon the buzz is swarming through the crowded halls. You go to your next class, and the poor befuddled teacher wonders where the sudden hyperactivity came from. Everyone is joking and laughing, just waiting for the intercom to click on and the principal to say that school will soon be letting out. It was a given—snow in Pinnacle, early dismissal. Sometimes people started the “snow in Pinnacle” rumor just to be funny, which wasn’t funny at all. Don’t mess with a bunch of bored high school students who have just completed two glorious weeks of Christmas vacation at home—sleeping late, watching TV and snacking on holiday goodies. Don’t tell them it’s snowing in Pinnacle unless you know for sure that winter weather is definitely in the area. You know what happened to the boy who cried wolf. You see, when snow was sighted in the northwest portion of Stokes County—namely Pinnacle—it didn’t matter if it was 70 degrees in Pine Hall or sunny in Walnut Cove. The powers that be had to make a decision based on the safety of each and every student, so the well-being of the Pinnacle students had to be considered even if the weather was clear in Germanton. There were times I went home early with nary a flake of snow where I lived in the far southeast corner of Stokes. I envied those lucky Pinnacle people who were probably sledding down their driveways, but I was still glad to be out of school nonetheless. For years, I’ve randomly gone up to fellow South Stokes alumni, especially in the heat of summer, and said, “It’s snowing in Pinnacle.” Almost always I get a laugh and a comment that they, too, remember those magical words. I’ve wondered for a long time just how far back this “snow in Pinnacle” thing goes. So, this past summer, I decided to take matters into my own hands by conducting an informal poll at Lion’s Park in Walnut Cove. I found people as far back as Class of ’72 who remembered the comment. I located some as young as Class of ’95 who chuckled along with me in remembrance. This distinctly South Stokes phenomenon spans many years. I wonder if the North Stokes people had a similar phenomenon. And do the West Stokes folks have any such tradition? Is “It’s snowing in Pinnacle” still a relevant statement in the county schools today? When winter weather creeps in from Surry County to Pinnacle, I figure we still have to close all of the county schools, regardless of tropical weather in Sandy Ridge. January 2006 was a momentous month in my home. We went all modern and hooked up to the Internet. I’ve heard it argued that the Internet is an evil thing and should never be allowed in one’s house. The same was said about television when it burst onto the scene. I figure something similar was voiced when radio became popular. Progress always evokes a reactionary response from many folks. In fact, as I began to write this column, a relative of mine dropped by and said TV was the biggest evil to ever hit this country! You know what? They may be right. Progress is usually accompanied, sadly enough, by many evils. I actually admire people who choose not to have a TV, but I don’t think I am a rampant sinner because I do. I discovered that my TV set has a little button on it that says “Power.” When risque sitcoms, soap operas and nightly dramas come on, I hit “Power off.” But I’ll confess that I keep the power flowing when the news or a ballgame is on. And I must admit that this newest modern evil, a.k.a. Internet, has made historical research exponentially easier! So late one January ’06 night, I sat down at the computer to research William A. Lash Sr., whom some say was the founder of my hometown of Walnut Cove. After a few hours of dead-end roads, I gave up in frustration. I had learned very little that I hadn’t already read in Stokes County history books, which told me he had immigrated to our fair town from Bethania. In my aggravation, I decided I deserved some fun after all this eyestrain. Forget Lash; I wanted to read about the Moravians. I was fascinated with them now that my daughter was at Salem College, originally a Moravian institution of higher learning. In 1752 (purchase finalized in August 1753), Lord Granville of England deeded the Moravians 100,000 acres of North Carolina wilderness for an initial payment of 500 pounds. They named this largely unexplored land “Wachovia.” The elders in Bethlehem, Pennsylvania, prayerfully chose 12 Godly, unmarried men with varying skill sets to travel to this new property. Three others would assist in the journey but return to Bethlehem afterward. They departed on October 8, 1753, with six horses and a loaded wagon. As they traveled through Pennsylvania and Maryland, the weather was stiflingly hot. Crossing the Susquehanna, Potomac, James and Roanoke Rivers was sometimes death-defying. Bridges broke under them, horses got sick, food became scarce. One momentous day, these weary pilgrims sighted Pilot Mountain in North Carolina. Hope sprang anew as they sang hymns and exhorted each other with Scripture along the way. They followed the Mayo River to its juncture with the Dan River near present-day Mayodan. By this time, snow lay on the ground, and the Dan was swollen. After a few days’ layover, they were able to cross, and so made their way to what would one day be the town of Walnut Cove. Probably near the R.J. Reynolds facility at Brook Cove, they crossed what they called the “Down Forck Creek” and soon came to the border of Wachovia (just past the present-day town of Germanton)–the property they felt God had granted to them. On the evening of Saturday, November 17, 1753, these 15 Moravian men reached their destination–a deserted cabin with no floor and a leaky roof at the site of what is now Historic Bethabara Village. The first thing they did was kneel to offer thanks unto their God. With wolves howling all around, the closely-knit band of pioneers shared a simple lovefeast and held a church service with joyful singing and prayers of thanksgiving; they had reached their promised land. By this time, my eyes were misty as I thought about these singleminded men of God who uncomplainingly sacrificed so much to build a better society for their people. At the end of the article, the names of these 15 chosen men were listed. As I scrolled down the list, I stopped at “Jacob Loesch.” His name leapt out at me as something quickened in the pit of my stomach. Suddenly I knew. THIS WAS IT! With a few more minutes of research, I proved my instinctive hypothesis: Through a name change for easier spelling, “Loesch” had become “Lash.” This incredible man, Jacob Lash, who was also the warden/minister of the Moravian brethren, later bought land on the Town Fork Creek in what is now Walnut Cove. He was the grandfather of the man I had originally been researching, William A. Lash Sr. Here I was 253 years later, about to burst with pride that the roots of my little town reached all the way back to such a Christian man. I thanked God for modern conveniences such as the worldwide web and went to bed, having found my Lash connection without even looking for it! 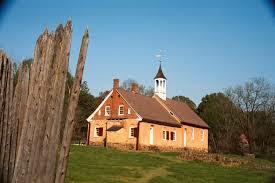 The church in Historic Bethabara Village in Winston-Salem, NC.